Boyds, MD (March 7, 2018) – As the National Women’s Soccer League enters its historic sixth season in 2018, women’s professional soccer in the United States has reached an unprecedented level of quality and sustainability. Meanwhile, the U.S. Soccer Girls’ Development Academy, currently in the midst of its inaugural 2017-2018 season, is laying the groundwork for a women’s professional player development pathway on a scale that has never been seen. With seven NWSL clubs operating a total of 10 Girls’ DA programs across the country, a wide variety of opportunities that have previously only been available for Boys’ DA players in Major League soccer academies, are finally opening up for elite female athletes. The Washington Spirit is one of three NWSL clubs – along with the Portland Thorns and Sky Blue FC – that launched two Development Academy programs for the opening season. Spirit Academy – Baltimore Armour, under the direction of former MLS star, U.S. Men’s National Team member, and accomplished youth coach Santino Quaranta, is establishing a new destination for top players in the Maryland community. On the Virginia side of the Spirit Academy, longtime D.C. United Academy coach Tom Torres is working to help build a professional academy model that is unprecedented in the women’s game. As Quaranta, Torres and their respective coaching staffs work tirelessly to grow the Maryland and Virginia programs, the Spirit Academy maintains a “One Club” philosophy, which provides every player in the Washington Spirit organization with a meaningful connection to the professional team. Washington Spirit head coach and general manager Jim Gabarra, a former olympian and U.S. Men’s National Team player is one of the world’s most experienced women’s professional soccer coaches, and oversees every aspect of the club’s soccer programming. In addition to the NWSL side and the academies, the club’s comprehensive structure features a highly-successful Spirit Reserves team in the WPSL, a sizable Super Y League program and a multitude of youth club partnerships throughout the region. In all, the club works directly with nearly 1,000 players outside of the professional team, and monitors thousands more through affiliated partners. No. 1 overall NWSL Draft pick and U.S. National Team midfielder Andi Sullivan, University of Florida alum Meggie Dougherty Howard, and additional 2018 draft picks Maddie Huster, Schuyler DeBree and Rachel Moore, all played for the Spirit Reserves prior to going pro. This offseason, National Soccer Hall of Famer Briana Scurry joined the Spirit technical staff as the first assistant coach of the pro team, and as a technical advisor for the Spirit Academy. Scurry, the most decorated goalkeeper in U.S. Women’s National Team history and a member of the legendary “99ers”, is a FIFA World Cup champion and a two time Olympic gold medalist. Scurry has joined a Spirit Academy staff which also includes Strength and Conditioning Director Lori Lindsey, a former teammate of Scurry’s with the U.S. Women’s National Team and the Washington Freedom. Along with her duties with the pro team, Scurry has spent the winter of 2018 providing instruction at the Spirit’s Youth Training Camps. Even in the inaugural season of the Girls’ DA, Gabarra and the NWSL technical staff have wasted no time in taking ambitious steps to integrate the Spirit Academy with the pro team. Several members of the Spirit Academy, including U.S. Youth National Team players Jordan Canniff, Gabrielle Robinson and Cayla White, have received regular opportunities to train with the NWSL team over the past year, going head-to-head with the likes of U.S. Women’s National Team rising star Mallory Pugh. In 2017, Pugh signed with the Spirit to become the NWSL’s youngest current player at age 19, and the led the team with six goals as a rookie. She is one of the first women’s soccer players to forgo a college career, and is viewed by many as an example of an exciting glimpse into the future of the fast-growing sport. If anyone knows what it’s like to be Pugh, it just might be Quaranta. The 33-year-old Spirit Academy – Baltimore Armour director was selected by D.C. United in the first round of the 2001 MLS Draft at age 16, making him the youngest player in MLS history to be drafted at the time. In present day MLS, teenagers as young as 15 are regularly signed as Homegrown Players directly from their academy teams. While the NWSL and Girls’ DA are carving their own path – not seeking to simply create a carbon copy of the men’s side – there will be similarities as the game continues to grow. During the 2018 season, Spirit Academy players who get called up to train with Washington’s pro team will have the opportunity to work with, and compete against even more world-renowned professionals, including U.S. National Team players Rose Lavelle, Taylor Smith, Ashley Hatch and Sullivan. They’ll also have the opportunity to extract unlimited wisdom from seasoned veterans such as Joanna Lohman and Tori Huster. Although the Girls’ DA is less than a year old, the building blocks are in place as the NWSL is the only U.S. Soccer Federation Division 1 women’s professional league in existence, attracting the top players from over 30 countries around the world. On the men’s side, MLS is the only USSF Division 1 professional league, and it has inextricable ties to the U.S. Soccer Boys’ Development Academy, which recently celebrated its 10-year anniversary. Of the 23 current MLS clubs, all but one – Toronto FC – participate in the Boys’ DA. Torres, who is a member of Gabarra’s NWSL technical staff along with being the technical director of Spirit Academy – Virginia, was heavily involved in the building of D.C. United’s foundational relationship between its MLS team and academy over the last decade. Ultimately, the NWSL is the tip of the pyramid in women’s soccer, and a small fraction of one percent of youth players will ever reach that level. However, the Washington Spirit is the only club in the D.C., Maryland and Virginia area with the resources to provide players with a direct measuring stick for what it takes to reach the pinnacle of the sport. U.S. Women’s National Team head coach Jill Ellis told ESPN last week that she has a “very good relationship” with Gabarra, as they work closely together in developing five Spirit players who also represent the USA. World class players like Sullivan and Dougherty Howard made the leap from the Spirit Reserves to the pros. A growing number of youth players are rising from the Spirit’s Super Y League programs to the Girls’ DA. On National Signing Day 2018, the first Spirit Academy senior class saw 15 players announce their college commitments, with more expected in the coming weeks. Through multiple powerful partnerships with youth clubs throughout the D.M.V. region, the Washington Spirit organization has an overall reach of around 20,000 players. For all members of the club, from National Team stars to Under-8 beginners, the mission is the same: To develop, support, challenge, and inspire world-class players and coaches in a professional environment. While our Maryland and Virginia clubs operate separately as two competitive members of U.S. Soccer’s Northeast Division, the over-arching philosophy on how to develop elite youth players into successful professionals and national team members is the same. Each Academy Director – Santino Quaranta in Maryland and Tom Torres in Virginia – report to Washington Spirit head coach and general manager Jim Gabarra, the most experienced professional women’s soccer coach in the world (and a former U.S. Men’s National Team member and Olympian himself). 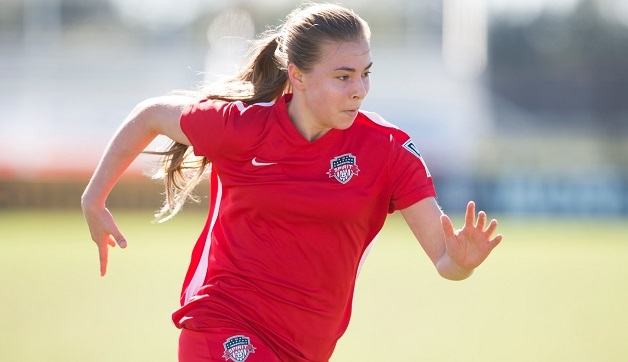 Washington Spirit Academy teams; inaugural U.S. Soccer Girls Development Academy season.